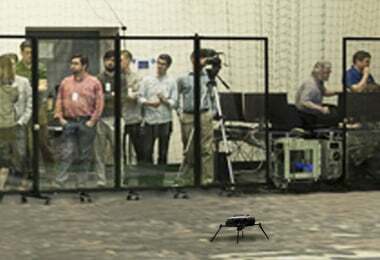 Here, clear Screenflex Room Dividers protect spectators from flying drones at a NASA testing facility. Clear room dividers ranging from three feet four inches long (one panel) to 10 feet long (three panels) are connected with multi-unit connectors to form a continuous clear wall. The safety barrier provides a division with vision of the drone landing pad along with the safety of the spectators. The 3/16 inch crystal-clear OPTIX® clear room divider meets high government safety standards. The clear acrylic walls received the highest rating in durability, protection, and versatility from consumers. As a result, they are the ideal choice for use in rigorous environments. NASA not only uses the divider as a safety barrier for drones but as a barrier for experiments and presentations as well. As an added bonus, wet-erase markers can be used on the clear panels for annotations during experiments or to display data for guests. Just like our standard dividers, clear room dividers arrive fully-assembled and ready to use. Self-leveling casters wheels maintain a balanced and sturdy unit. For further information on Screenflex clear room dividers, contact a Screenflex sales representative at 855-960-6020 or a screenflex.com.